A miniature, portable, multifunction device that not only helps with electromagnetic field (EMF) protection, but also acts as a relaxation and stress-relief aid. 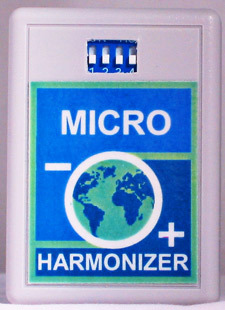 The Micro Harmonizer outputs a 7.83 Hz field (the Earth’s natural field, also called the Schumann Resonance), which blankets your body and overcomes negative fields such as those from computers, TVs, appliances and microwaves. The 7.83 Hz field also falls into the Alpha brain-wave frequency, which represents conscious yet relaxed awareness. The 3.91 Hz setting puts the brain into a Theta state of deep relaxation. A flashing LED assists with stress relief and is used together with the Hz settings to enter either Alpha or Theta brain states. The energy extends about nine square feet around you. Unit measures 2 1/4”L x 1 1/2”W x 3/4”D and operates on 3-volt replaceable lithium watch battery (#CR2032); lasts 6-9 months with average use (2-3 hours per day). Weighs 1.3 ounces. Designed to be next to the body, the unit can be placed in a pocket or worn on a piece of clothing with the attached clip. Available in gray (pictured) or black. From the makers of the Total Shield and Mini Harmonizer. 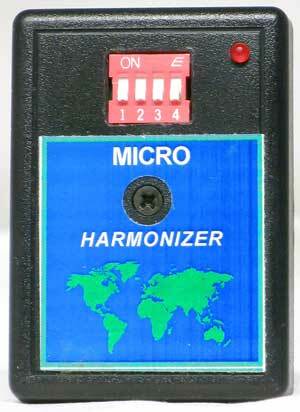 Click here for the Micro Harmonizer manual.